Cozy, Authentic Cabin, 2 Quartos, 1 Banho, (4 pessoas). Conveniências modernas. Se você sonhou com uma aconchegante, cabana romântico para desfrutar durante alguns dias, este é o que você está procurando. Você nunca vai esquecer o céu azul brilhante contra o Monte Elbert, o pico mais alto do Colorado, o ponto de vista de lagoas de castor, todos sentados pelo fogão a lenha, olhando para o fogo através da sua porta de vidro, em uma cadeira de couro agradável. Um muito confortável, não-fumador dois quartos, uma cabana de banho, Buckeye's Cabin está localizado a 10.300 pés no meio de Fourteener Região do Colorado, a poucos minutos fora de Leadville, uma antiga cidade mineira histórica, a 20 minutos de Copper Mountain e 40 minutos Vail e outras estâncias de esqui de classe mundial. Great cozy place, just a few minutes from downtown Leadville. Very special place, we got engaged on top of Mount Sherman the weekend we stayed here! Our third stay, it's like home! This was our third trip to Leadville over Spring Break, having skied Copper Mountain twice and Ski Cooper once. This place continues to be preferct for our family of four. It's located on the north side of town, about three miles from the Leadville Safeway to the south. You are closest to Copper and Ski Cooper, both north of Leadville. You have the feeling of being in a secluded cabin setting, yet less than a few minutes from the grocery store. There are many personal touches to really make you feel at home. It's about 20 miles to Copper Mountain, one of my favorite CO mountains, as the mountain is huge, one of the famous 'Summit County' hills, lift lines are short, and it's not pretentious. Plus, being able to stay in Leadville vs a high-end condo is more appealing to our family. And, the owner is a really easy guy to work with. Although we have never met face to face, I consider Paul a friend after three years of swapping snow reports! This is our second year in the Tashi, a 2-bedroom cabin, one BR with a queen, the other bedroom with twin beds. We stayed in the Buckeye once, also an awesome cabin. Kitchen is well stocked, huge porch, very clean gas grill for your steaks or burgers. The woodbunring stoves work great, maybe too great. Three years and we still can't get a comfortable 'burn', either too hot or needs more wood...but it's fun having a fire. Beds are comfortable, and the living room has easy seating for four. It's a cabin...plugs are a premium and with this being the 'gadget age', ie phones, computers, Go-Pro, boot dryers, i-Pads, Nooks, Garmans, etc (kind of embarrassing! ), it can be a challenge. But, there are a few plug in power strips to get stuff charged as long as you don't want it bedside. Also, no dishwasher or washer/dryer, but the website accurately reflects that. Pictures are spot on! At the end of the day, if we plan to return to Leadville, I wouldn't consider another property unless this one is booked. No, it's not a five star condo, but good luck finding one in Leadville, as that's not Leadville's vibe. It's clean, comfortable, priced right, and just an absolutely charming place to stay. You have a great feeling of being in the mountains, with town only a few miles away. While we only stayed 2 nights and the weather was very rainy (much needed, however) we had a great time in Leadville and the cabin was a great place to return to. 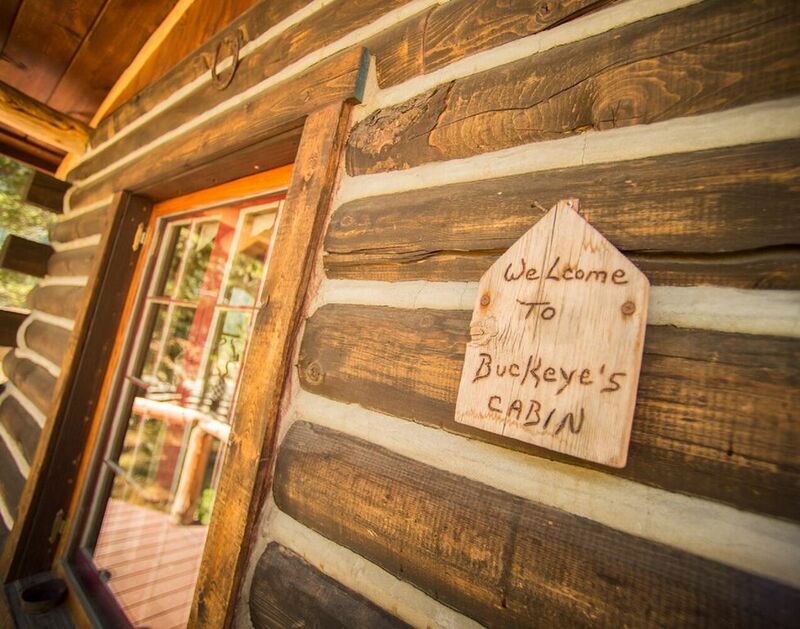 It's obvious that the owners have put time, energy and love into Buckeye's Cabin. It's both charming and functional. It is extremely clean, the furniture is comfortable and the appliances through-out work well. Our cell phones didn't work there, but the available phone worked just fine. It allowed us to contact the Georgetown Loop RR to up-grade our reservation to 1st Class the morning of our ride, giving us a warm, enclosed car to enjoy the trip on a very wet day. The crocheted and tatted pieces through out the cabin made it feel very warm and welcoming. We look forward to comming back to see some of the things that had closed after Labor Day or that we just couldn't fit into our abbreviated visit. Thank you, Paul and Marie-Christine for sharing your cabin with us. My family stayed here just after Christmas for 14 days. We skied Cooper, only 20 minutes away, and Sunlight, about 1:45 away. The cabin is perfect! Just what you would want and expect from a mountain get away. My two children, 4 & 10, loved it. And yes, "the stove of the future," 1960's style was fun to cook on. A smoky smell from the wood heater was charming. The satellite TV, the hot, hot water in the shower, the decor everything is just great. You are foolish to choose another place to say in or near Leadville.